We advise on conservation management planning for NGOs, government and private sector clients, collecting data, developing and implementing plans both within and outside of protected areas and nature reserves. Our primary conservation focus relates to monitoring of sea turtles and humpback whales in Oman under international aid programmes and funded by and private organisations in partnership with Environmental Society of Oman. Our staff are engaged in international whale conservation studies, including attendance and presentations at IWC events. Our work in this area has led to our staff to publish a number of books and we have had the privilege of supporting the BBC with their Wild Arabia series – see More Stuff. Our team undertakes cetacean research under the umbrella of the Environment Society of Oman. 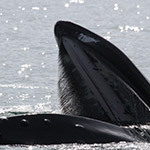 The project specifically focuses on the monitoring of an important humpback whale population that is resident in the Sea of Oman. The research includes field surveys, acoustic research, genetic studies, population estimates and behavioural studies in collaboration with national and international academic institutes and NGOs. 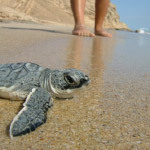 Our team undertakes research, monitoring, satellite tracking, protected areas assessment and planning, and strategic conservation management planning for hawksbill, loggerhead and green turtles population at key nesting sites in Oman, including some of the world’s largest and densest rookeries. 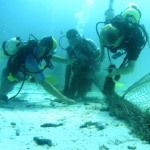 Project is funded by the US Marine Turtle Conservation Fund and run in collaboration with several US government agencies, as well as local government offices in Oman. Our team led Phase I of the Qatar Dugong Conservation Initiative which was funded by Dolphin Energy. The project aimed to re-invigorate Dugong population assessments and conservation in Qatar by undertaking population assessments, participatory data collection, stakeholder engagement, training and analysis to serve as the foundation of a Qatar led Dugong conservation initiative which will allow stakeholders in Qatar to lead future assessments in their own right in Phase II. 5OES were responsible for all aspects of project design and implementation, providing a specialist team of recognised regional experts in Dugong and marine mammal conservation, participatory data collection, training and collaboration.